"Short on miles but long on scenery, The Amador Central is a photographers delight". So wrote author David Lustig in the July 1977 issue of Rail Classics magazine. 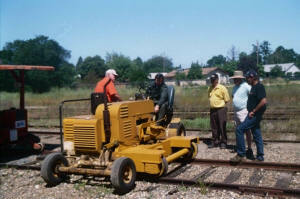 The large group of MOW members and their guests who participated in the Ione Speeder Rail Fair and M.O.W. Expo experienced the description of that long ago article. 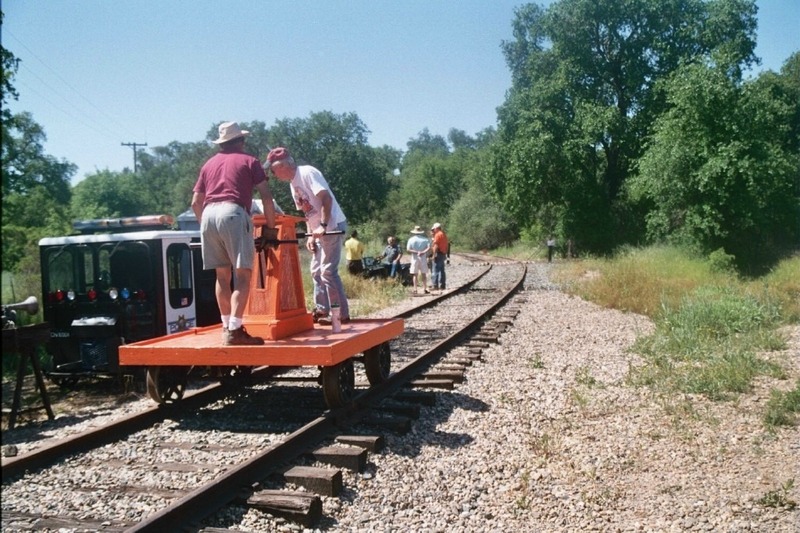 Now known as the Amador Foothills Railroad, the AFRR was the site of this important event on May 13-14, 2006. The track-mobile is owned and operated by Brett Tallman. It is the worlds smallest Whiting track-mobile. It can haul up to 3 loaded boxcars. All photos by Mike Raposa. Recreational Railroad Coalition, Inc. (RRC) leases the AFRR using it exclusively for recreation and education purposes. Sierra Pacific Industries, owner of the railroad, is using the services of RRC to protect and preserve their tracks and the right-of-way. RRC also leases the Linden Branch of the Stockton Terminal & Eastern Railroad between Stockton and Linden. Larry Bowler, President of RRC stated that they are negotiating for a third railroad in the region. The handcar shows two unidentified participants at the Rail Fair "motating" east bound on the Amador Foothill Railroad mainline. With 30 speeders either on the tracks or on display, as well as a collection of historic mow equipment, local community leaders and members of the recreational railroad community quickly described this event as "a blast" and "a great event" as well as other accolades. 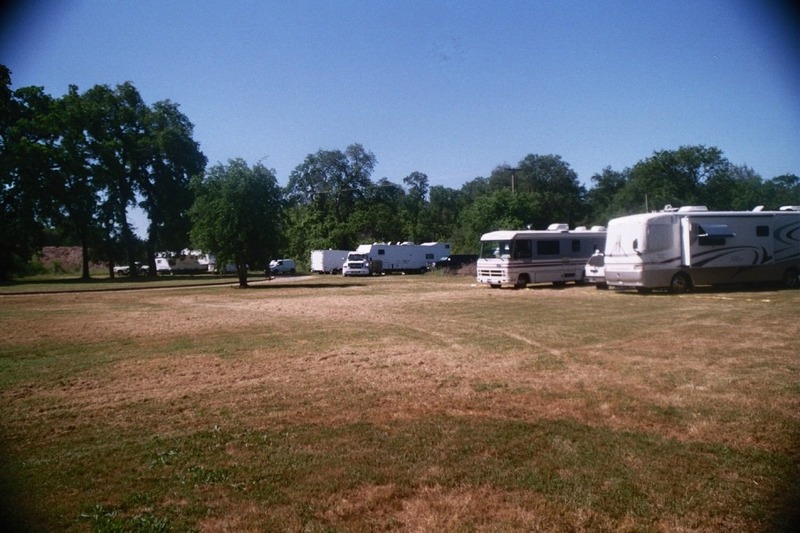 A Hobo Camp was set up for these modern day tramps who brought their RV&apos;s, tents and vans to spend two days alongside the tracks eating hot dogs, stew and other victuals conjured up on their propane stoves. The RV's are part of the Hobo Camp set up alongside the tracks for "civilized Hobo's." Pat Coleman, President of NARCOA was present with information on this international organization. Three former employees of the AFRR appeared and participated in an interesting "living history" presentation by the Amador Historical Society. With the schedule calling for two runs each day with a night run on Saturday, the tracks of the AFRR were well shined by the steel wheels of everything from "A" cars to "S" cars. The smallest track-mobile was present and made it&apos;s own run to the 5 mile marker and back. Dave Balestreri, Excursion Coordinator, Grant Vogel, AFRR RRC Roadmaster and Mike Quesada Flagging Crew Foreman were relieved and gratified with this outstanding event. Vogel wrote to the President of RRC "Total Success" which sums up the overall grade of this Ione Speeder Rail Fair & M.O.W. Expo.